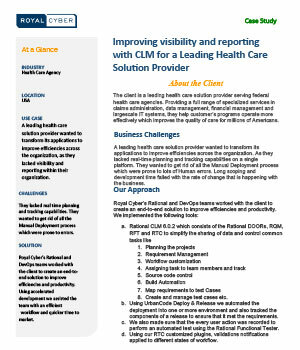 A leading healthcare solution provider wanted to transform its applications to improve efficiencies across the organization, as they lacked visibility and reporting within their organization. They lacked real-time planning and tracking capabilities. They wanted to get rid of all the Manual Deployment process which were prone to errors. Royal Cyber’s Rational and DevOps teams worked with the client to create an end-to-end solution to improve efficiencies and productivity. Using accelerated development we assisted the team with an efficient workflow and quicker time to market.